(CNN) – In an act of protest, Jon Huntsman will not attend the Republican national convention this August in Tampa. The former Republican presidential hopeful, Utah governor and ambassador to China said in a statement that he won't participate in the convention or others in the future until his fellow conservatives start tackling the bigger issues. Huntsman said that despite being asked repeatedly about his attendance, this year's convention will be the first he has not attended since serving as a delegate for Ronald Reagan in 1984. "I will not be attending this year's convention, nor any Republican convention in the future, until the party focuses on a bigger, bolder, more confident future for the United States – a future based on problem solving, inclusiveness, and a willingness to address the trust deficit, which is every bit as corrosive as our fiscal and economic deficits," Huntsman said in a statement, reported first by the Salt Lake Tribune. Huntsman, reiterating the theme of "Country First" from his presidential campaign said, "I encourage a return to the party we have been in the past, from Lincoln right on through to Reagan, that was always willing to put our country before politics." Huntsman is the first of Romney's former rivals from the Republican primaries to indicate they would not attend the convention. But a smattering of other Republicans have already indicated they will not be there. Former Virginia Governor George Allen announced last week that he would not attend the convention due to the heated Virginia Senate race he's engaged in. Heather Wilson and Rep. Denny Rehberg, both GOP Senate candidates in New Mexico and Montana respectively also will not attend the convention to focus on their own races. Huntsman was my first choice for the nomination. I really wish he would have gained more traction early on. It's sad that a measured, reasonable, and intelligent approach doesn't attract more attention in a primary race (in either party). I still think the GOP will come away from the November election better off than the Dems, just based on history, public opinion, and necessity. It would have been nice to have a guy in charge of one of the two big parties that didn't see everything in terms of "us vs. them" though. Instead we get a choice between one of two juvenile, divisive, ego driven, demagogues. As an independent who's been voting Democrat lately, I'd have definitely voted for Huntsman. Only candidate on the Republican side that I've heard present a coherent, feasible set of ideas and plans for the country. He's also the only one who wasn't (a) strictly anti-Obama and nothing else, or (b) running on "electability" (we see you, Newt). Too bad intelligent, well-reasoned moderates are pariahs in this country these days. We can blame the politicians if we want, but we keep electing them instead of getting behind centrists like Huntsman, Lieberman, Guliani, etc. We're as much a part of the problem as the overly partisan politicians we're trying to blame. The root cause of most issues facing this country is that the populace favors grossly simplified one-liners over well-reasoned five minute responses, and thus we elect simple minds. Case in point: the Bush-Kerry debates. Kerry would give a measured, intelligently complex answer to a question, and then Bush would spout some one-liner like, "You're either for it or you're against it," or (now infamously) "We just need to get rid of all this government regulation." Non-solutions that play well in our under-interested, under-educated voters' ears, and so they re-elected him overwhelmingly. Not saying I agreed with what Kerry was saying, but at least he bothered to think about what his answers meant. The sad truth is, we're slowly becoming too stupid and disinterested for an effective democracy. Not that there's a better alternative, but the sorry state of our government is our own fault. 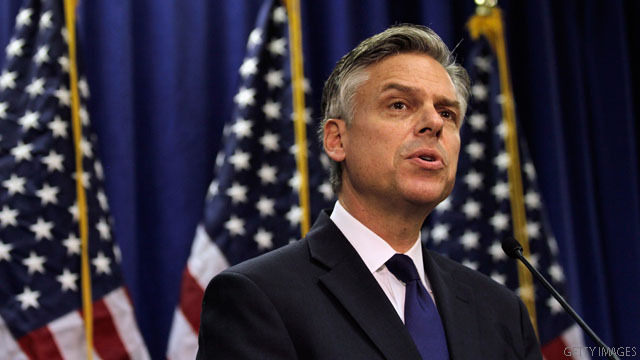 Mr. Huntsman would have been a far, far, better choice for the GOP to put up against Mr. Obama than Mr. Romney.